An airline has banned the sale of alcohol before 8am on its flights in a crackdown on bad behaviour. 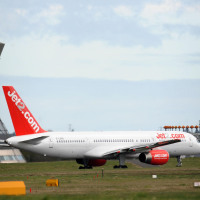 Jet2.com is the first airline in Europe to make the move on its early-morning services and is urging other companies as well as airports and shops to follow its lead. The budget airline has also called for sealed bags for alcohol bought in airports to stop drinking personal alcohol before and during flights. The company is running a high-profile campaign called 'Onboard Together' aimed at reducing disruptive and abusive behaviour by passengers on its flights. Hundreds of people were arrested on suspicion of being drunk on a plane or at an airport in the last two years. Figures obtained following Freedom of Information requests show at least 442 people were held by police between March 2014 and March 2016. The airline has refused more than 500 passengers travel, with over 50 of these given lifetime bans since 2015. Last week, Jet2.com passenger Joshua Strickland, 21, of Tadcaster, North Yorkshire, was handed a £12,000 bill and a lifetime ban after his "abusive and aggressive" behaviour led to a plane being diverted to Manchester. It is not unknown for flights to be delayed because of alcohol-related disruption. But taking out trusted travel insurance can protect against travel delays or cancellations. Jet2 Managing director Phil Ward said: "We have decided to follow up very quickly on my comments made last week, by taking positive action to allow the millions of customers and families who fly with us to travel with confidence and have a great experience with Jet2.com." "We believe that stopping sales of alcohol before 8am on our morning flights is an effective way to ensure everyone has an enjoyable and comfortable journey. We understand that we're the first of the European airlines to take this bold step and call upon industry partners in airports to also trade responsibly."